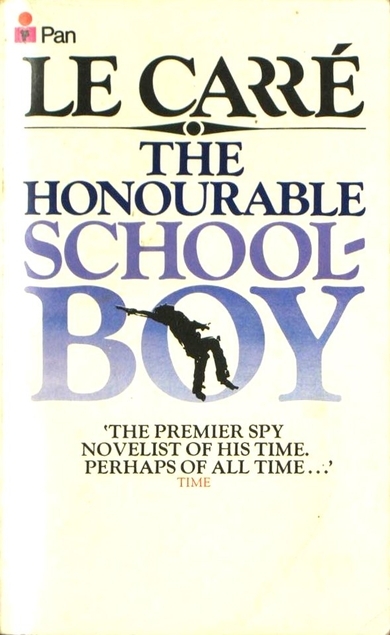 I was pleased when I realised that I could read The Honourable Schoolboy by John le Carre for The 1977 Club as we have all of his books in the overflow bookcases in the garage. Jack read them at that time. But I have only read A Small Town in Germany by le Carre previously. I was even happier when it dawned on me that this book won the James Tait Black Memorial Prize, I have a bit of a personal project going on to read as many as those prize winners as I can get a hold of. I loved this book although for me it was essential that I had the time to read it over quite a short period of time, it’s not a 30 pages at bedtime before you fall asleep sort of book. Also as I was reading it 41 years after it was published it has a distinct feeling of nostalgia and historical fiction now. It begins with the British secret service (the Circus) being under a cloud as far as the American ‘Cousins’ are concerned as Bill Haydon has not long been unmasked by George Smiley as a spy for Russia, recruited when he was a student at Oxford 30 years previously. Haydon had so much influence he had been able to have good members of staff pensioned off or elbowed out, leaving a very much weakened Circus. George Smiley is in charge of putting together a team to investigate money laundering in Hong Kong which was still a British Crown Colony at that time. He manages to bring back some of those that Haydon had ousted. The investigations lead from Hong Kong to Cambodia and Thailand and drug smuggling comes into it too. That’s all I’m going to say about the story, it’s quite convoluted as you would expect of a spy story, but I really enjoyed this one and the fact that I haven’t read any of the other Smiley books which were written before this one wasn’t a problem at all, although I had watched them on TV years ago. I must say that I think Alec Guinness was the perfect Smiley. 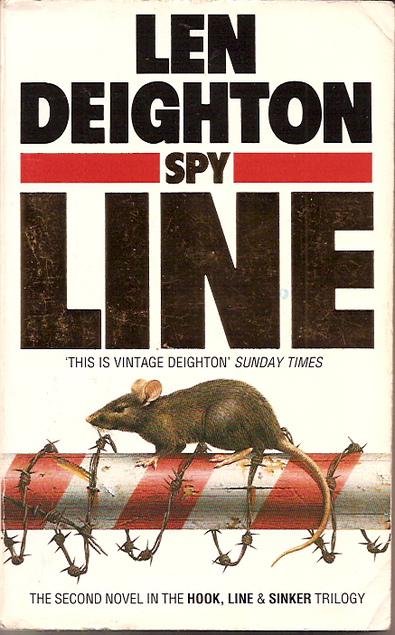 Spy Line by Len Deighton was first published in 1989 and it’s continuing the Bernard Samson story. The setting is Winter 1987. Bernie is in a terrible mess at the moment. As an MI5 man he’s been under suspicion for quite a while. Just as he was beginning to believe that his superiors trusted him again it transpires that they decide that he has been working as a double agent. In this book he’s on the run from British Intelligence and the Soviet KGB. Luckily he has contacts in East Berlin and he’s able to keep a very low profile. As ever I can’t say too much about the storyline, except to say that it’s a page-turner and Deighton’s descriptive writing is at times poetic. I’ll be going on to the next one in this series soon-ish, Spy Sinker. I actually finished this one about six weeks ago but it has taken me this long to get around to blogging about it. I signed up on Goodreads to read 90 books this year but I’ve completed that challenge already, mind you I knew that I would, I just didn’t want to be under stress towards the end of the year, if I had signed up for 125 or so. The amount of books I’ve read so far this year says more about our poor summer weather this year than anything else, I’ve been reading when normally I would have been gardening. 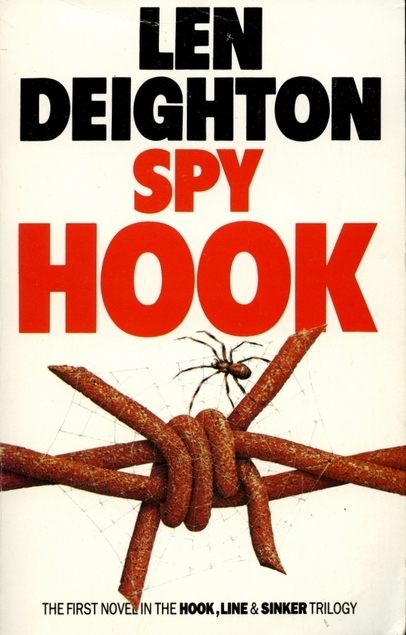 Spy Hook by Len Deighton is continuing the story of Bernard Samson but as ever I can’t say too much about it for fear of ruining it for any other readers. The book was first published in 1989. Bernie’s career prospects within the Department have plummeted and he no longer has the security clearance level that he once had. He’s under suspicion despite the fact that his bosses claim he isn’t. Bernie decides to start his own investigations but the use of computers is fairly new within the Department and as he keeps delving into computer files he keeps getting the message Access Denied. Obviously this just makes his position even more difficult, and he didn’t even realise that each of his attempts was logged on the system! Things in Bernie’s family life have gone from bad to worse, he’s a single parent now and to make matters worse his father-in-law is keen to get custody of the children. These books are surprisingly easy to read for espionage fiction, another page-turner. 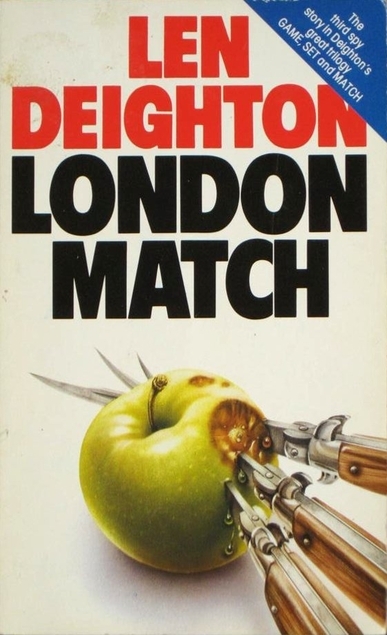 London Match by Len Deighton was first published in 1985 and it’s the third book featuring Bernard Samson and the various other ‘civil servants’ who were engaged in spying or spy spotting in London and West Berlin during the Cold War era. As you would expect, nothing can be taken at face value, leaks in the department mean that just about everybody is under suspicion of being a double agent. At the same time there’s a lot going on in the way of office politics and back stabbing and Bernard believes his children are in danger of being snatched. At 405 pages you would think that this wouldn’t be a quick read but it didn’t take me long (mind you the bad weather might have had a hand in that!) and I find Deighton’s writing to be really good and surprisingly descriptive, something that I appreciate. I’ll definitely be reading the next one in this series which is Spy Hook. Len Deighton seems to be one of those talented people who have successes in many different arts, that’s always impressive, and slightly annoying of course! London Match was one of my 20 Books of Summer. Mexico Set by Len Deighton is the second of his books to feature Bernard Samson, the first one being Berlin Game which I enjoyed recently. 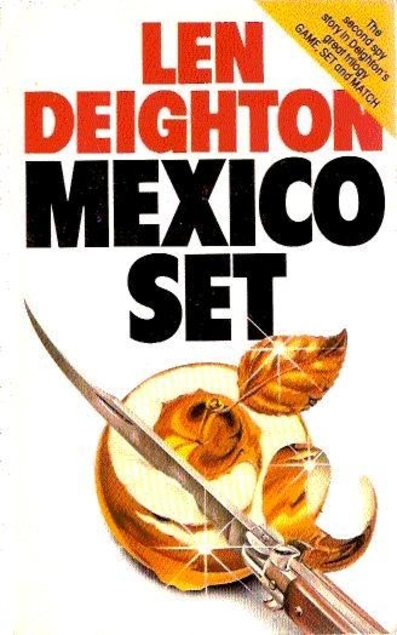 I must say though that I found this one to be even better and I can hardly believe that it has taken me so long to get around to reading Len Deighton, especially given the fact we have had all his books since they were originally published. Bernard Samson has been working in British Intelligence for years, as his father before him did, but he has had a shock to his system recently and he’s now a suspect figure within the world of espionage. There’s a lot of coming and going between Mexico, Berlin and London, it’s the Cold War era and the powers that be in London want to get a particular KGB operative to defect to Britain – will he? – won’t he? There’s also a lot of office politics going on, but it seems that the top jobs only ever go to Oxbridge candidates which is quite scary when you consider that according to another book that I read recently – Oxford and Cambridge accepted students with virtually nothing in the way of exam passes, the important thing was that your face/background fitted – up until as recently as the 1960s. I think that the author made a good job of the atmosphere in all of the countries but particularly the situation for people living in East Berlin and unable to see their families in West Berlin. It’s a fact that in those days whenever you (I) met any people who had been originally from ‘eastern bloc’ countries, they always had a flamboyantly embroidered imagination of the past – they were always from a family that had masses of land and property – and even aristocratic titles which was/is laughable but at the same time terribly sad. The Lonely Skier by Hammond Innes was first published in 1948. It was a time when there was a big market for spy/wartime thrillers. It seems that men who had come back from the war enjoyed indulging in their dangerous and exciting atmospheres, in the safety of peacetime. The Loneliest Skier is very much in the same vein as John Buchan’s writing. The tale is told by Neil Blair, who has been demobbed from the army and has tried his hand at a couple of businesses which failed. He’s married and has a small child, so he’s very depressed at his penniless state. When Neil bumps into an old acquaintance in a pub he jumps at the chance of the job he is offered, despite the fact that it means travelling to the Dolomites and being away from his Peggy again. Neil had been hoping to make a career in writing, and his old friend is a big name in film making. Neil is supposed to be employed as a screen writer but that’s just a cover, his friend wants him to spy on the goings on in a mountain hut situated above Cortina in the Italian Dolomites. He’s to report on any of the people frequenting the place, and they turn out to be a dangerous bunch. Some day Germany will begin to organise again. And next time – this time – perhaps we shall not fail. Already you are saying that Germany must be prosperous so that she can take her place in the economic plan of Europe. We have no national debt like you. Each war has been paid for in the ruins of defeat. We starve now, and that means that the old people die. And that again is good for a nation. Our industry is destroyed. And that is good. Our industry, when we rebuild it, will be new and up to date, not old works adjusted to meet the changing needs like yours. This is exactly what happened and people in Britain were left wondering who had actually won the war. This is an enjoyable read featuring a ski chase which is a bit different and more exciting than your usual manhunt. 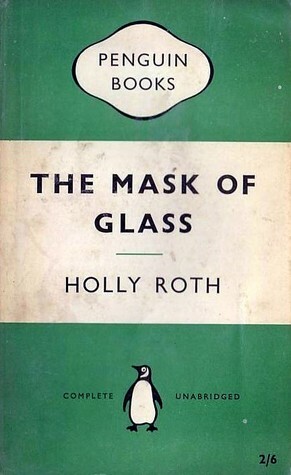 Holly Roth was an American writer and The Mask of Glass was first published by Penguin in 1957. It’s very much a product of the times but a great read all the same. Young Jimmy Kennemore is working in the US Army’s Counter- Intelligence Corps. It’s his dream job. His work hours are flexible, he gets a great allowance for clothes and living expenses and each week he is given an assignment in a briefing session in Manhattan. When he’s given the task of tracking down a deserter from the US Army, Sergeant John Antonio Viola, he begins by visiting Viola’s old school in the hope of being able to interview some of Viola’s old schoolfriends. This leads to Kennemore stumbling into a situation which even he can’t quite believe, involving high flying military leaders and politicians. This is a thriller rather than a murder mystery and it reflects what was going on at the time in McCarthy’s America. There was a lot of paranoia although to be fair it was fuelled by a few spies such as Alger Hiss, Klaus Fuchs and the Rosenbergs who had been caught passing on information to the USSR. I do enjoy a blast back to the Cold War era now and again. It makes me feel quite nostalgic! Sadly, in 1964 Holly Roth fell off a small yacht when she was sailing in the Mediterranean and her body was never found. This is the second book by Holly Roth which I’ve read, the first one being The Content Assignment which I liked but I think I preferred this one. I had forgotten about Eric Ambler despite the fact that he was one of the authors that my Dad enjoyed reading, along with the likes of Alistair MacLean and Dennis Wheatley. But yet again I was in the kitchen, making soup I think, and listening to Radio 4 extra when a dramatised episode of one of Ambler’s books came on and jogged my memory. So when I was at the library recently Journey Into Fear jumped out at me from the edge of one of those book carousel thingys, it was obviously time to give him a go. It’s a Penguin Modern Classic which was first published in 1940 and as always with these books I avoid the introduction until I’ve finished the book because they always give crucial details of the storyline, right to the very end, which I would rather find out for myself as I read the book – why do they do that? It’s SO ANNOYING! It’s World War 2 and Mr Graham is an engineer and an arms expert and because of his quiet and amiable personality he has become useful to his employers as a negotiator of contracts abroad. He has just been having high-level talks with the Turkish government in Istanbul and it’s time for him to make the journey back to England. Unfortunately someone has a different idea and is determined to kill him before he can leave Istanbul. How can Graham get back home in one piece? I did enjoy this one and I’ll read more of his books. If you like reading John Buchan then you’ll probably like this too, it’s quite similar in style. In fact the introduction, which I read after I’d finished the book does mention that Ambler is a sort of combination of Buchan and Ian Fleming, but I’ve never read anything by Ian Fleming, other than Chitty Chitty Bang Bang. It was made into a film in 1943, which you can read about here. In the film Mr Graham’s nationality is changed from English to American, as often happened in films.